Decisively for the security appreciation of pre-stressed concrete constructions is near the condition of the prestressing anchor essentially the real size of the prestressing force. The measuring procedure which uses the magnetoelastic effect of ferromagnetic materials is the most suitable measuring method the force or stress without contact to the steel. A couple of magneto-elastic techniques are in practical use. Especially methods using the change of magnetic material properties by stress resulting a high sensitivity.It has to be noted that the eddy-current measuring ,,, the multi parameter modelling (3MA) , and the transformer measuring technique ,,,, use the magnetoelastic effect. These methods differ fundamentally in magnetic and electric values and have been investigated by the magnetoelastic stray field measurement. The magneto-elastic effect is based on the interaction of elastic stress and magnetic energy. The relation between these two energies is called magneto-mechanical coefficient of coupling k33. The magnetostrictive length variation l is a consequence of remagnetisation processes in the material. When applying a magnetic field to ferromagnetic material, the Weiss-domains magnetisations are directed from the initial situation towards the outer field by wall displacement and domain rotation. The turning processes are accompanied by length variations. The k33 factor can only be calculated accurately for materials with well-defined crystalline structures without impurities. Also the material's magnetisation properties have to be well known. In  an estimation has been published which approximately describes the mechanical stress as a function of magnetostriction and magnetisation. The presumption is that the crystal energy is negligibly small. This applies however only to single crystals. Apart from a few exceptions metallic elements consist of simple lattice structures. Iron for example can exist in two different crystalline forms a face-centred cubic lattice (fcc), and the body-centred cubic lattice (bcc). At temperatures near the melting point iron has an austenite structure (fcc). It is not magnetic, tough and can be hardened by work hardening processes (manganese-, nickel-, chromium-nickel stainless steels). With defined cooling procedures and the addition of certain elements we get a structure consisting of the phases ferrite and cementite. The so-called pearlite structure exhibits magnetic characteristics due to its ferrite portion. It is very stable and only slightly deformable. At high cooling rates another structure, the martensite structure, with hard and dry characteristics comes up. The crystalline structure is body-centred like the ferrite structure. The types of structure mentioned exhibit most diverse magnetic characteristics. This can be attributed to the cooling process and the material´s mixing proportion and the residual stress situation of the structure. The interaction of all influences mentioned affects the magnetisation and the magnetostriction of the material. As a first step the magnetic properties were examined. So the B-H-curve was measured by integration of the magnetic tension and flux regarding the steel bars. The cylindrical steel specimen were 100 mm long and about 5 mm in diameter. Different qualities of steel (St 1860: pearlite steel and St 37: ferrite steel) of different manufacturers were tested. Fig. 1 shows the measurement's results. It is obvious that the high grade ferrite steel (St 37) has a higher saturation magnetisation than the pearlite structured steel. Fig 1: B-H-curves for two different steel qualities, machining steel St 37 and St1860. At present measurements of magnetostriction on the same steel samples (St37 and St1860) are taken with the help of strain gauges. The results are submitted shortly. First tendencies agree with the results by , depending on the steels actual stress situation. If ferromagnetic material is under residual tensile stress (s > 0) or tensile stress is applied, the magnetisation is facilitated. The length changes by magnetostriction with tensile stress are smaller than those without. If on the other hand the material is under compressive stress (s < 0), more energy is needed in order to magnetise. At the same moment the relative length change e +l will be greater. The reason is that the strain -e before an elongation l of the material has to be overcome by magnetising. Fig. 2 illustrates the influence of stress on magnetostriction of structural steel. Fig 2: Results of magnetostriction measurement of tensile and com-pressive stress . A pair of Helmholtz-coils was arranged to realise an accurate bar magnetisation in terms of symmetry. The magnetic stray field was measured at the surface of a steel bar (see fig. 3). The magnetisation was obtained sufficiently homogeneous by a coil diameter of 84 mm and a bar diameter to 6 mm. Fig 3: Non-coupling Helmholtz-coils on ferromagnetic specimen. By arranging of the coils this way the magnetic coupling is affected. Under a coupled coils condition the steel bar is magnetised in axial direction. In contrast non-coupled coils magnetise the bar in radial direction close to the sensor. According to the Villari effect the permeability changes by external stress and the magnetic stray field also varies. This magnetic stray field is measured in the tangential and normal component by the magnetic field sensor (s. fig. 3). The high sensitivity demand of the stray field measurement requires the use of flux gate sensors. The utilised equipment was a MAGNETSCOP 1.068 with transverse probe of the Foerster company. In preliminary approaches simulations with the help of the finite elements method have shown that the significant magnetic field changes in the surface of the rod. The following figures show the simulation results of a field excitation with non-coupled Helmholtz-coils. Fig. 4 represents the normal component course of the magnetic flux density Bnorm, whereas fig. 5 shows the plot of the tangential component Btan. The assumption of a radial stray field component closed to the sensor was confirmed by simulation results of non-coupled coils. The central position can easily be found by zero-crossing detection of the tangential field component. This curve (s. fig. 5) is of sinusoidal character. Fig 4: Plot path of Bnorm in the near of an iron rod . According to  the wave forms are changed due to mechanical stress. The tangential components harmonic analysis represents a possible evaluation method. First results have been listed but an extensive evaluation of the measurements is in proceed. Fig 5: Plot path of Btan in the near of an iron rod . Fig 6: Clamping jig with fixed specimen. In the following chapter the influence of tensile stress (s+) in structural steel on the magnetisation has been examined by means of stray field measurement. The middle wire of a prestressing steel cable with a steel type of St 1860 is used as specimen. Fig. 6 shows the excitating field arrangement. 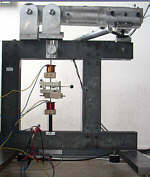 The force F in the steel rod is measured by a load cell. A high precision flux gate sensor measures the magnetic stray field. The magnetoelastic effect caused by mechanical stress on the ferromagnetic rod is characterised by an irreversible and reversible part of the magnetisation. An additional magnetic stray field is the result. Our measurements start with a prestressing sstat of 120 MPa and follow with an alternation and an amplitude samp of 55 MPa (see fig. 7, load cycle). Fig. 7 show the measurement data plotted versus the number N of sampled data. After the irreversible process, s. fig. 7, Bir the magnetoelastic effect becomes reversible, s. fig. 7, Brev. The measured Bir differs from Brev taken from the reversible process. Still intense examinations are necessary for the application as a magnetoelastic stress sensor. Fig 7: Magnetisation by irreversible magnetoelastic stress. The investigation of the reversible magnetisation process gives information about the sensitivity of the measurement. The deviation of the plotted curve in fig. 8 depends on parameters like the magnetostrictive coefficient and the magnetisation of the steel. The investigation of magnetoelastic stress measurements is a subject matter in . The sensitivity can be improved by an applied magnetisation in hard axis of the rod. Fig 8: Reversible magnetoelastic stress measurement. Simulations of an optimised field with the help of finite element method have to calculate in future. An easy to handle sensor with an clamp-on technique can be achieved. For the detection of load characteristic the method of the stray field measurement was consulted. As already implied above the characteristics of the stray field change while charging and discharging the steel bar (see fig. 6) was investigated. In this arrangement the variation of stress amplitude samp are detectable by the magnetic stray field measurement. After each load cycle the stress amplitude samp was slightly increased. Up to a stress s of 175 MPa the amplitude was decreased to the original value of samp = 12 MPa, s. fig. 9. The static prestressing sstat = 115 MPa was constant for the whole measurement. Fig 9: Improved Measurement Sensitivity by Magnetisation in Hard Axis. A characteristic curve of stray field data results from a dynamic load cycle. It is defined by the irreversible and reversible processes of magnetoelastic stress. A pattern recognition allows the dynamic load detection. Fig 10: Working loads caused by cars and lorries. Fig 11: Dynamic and static load detection. Force and stress measurement of reinforced concrete elements is feasible in principle using the magnetic stray field sensor. The intension of this work is to inspect further investigations of irreversible and reversible processes of magnetoelastic stress. A method of signal processing is to be developed for the necessary reproducibility. Also the important advantage is that the measured data are calibrated with the steel's magnetostrictive expansion curve. A load cycle detection seems to be possible with the help of pattern recognition. A self-controlled method can be realised by the magnetic stray field measurement. The prospect is an anhysteresis magneto-elastic stress measurement instrument with low power consumption. This work was promoted by the Deutsche Forschungsgemeinschaft (DFG). The authors would like to thank the DFG for the financial support. They also owe sincere thanks to Dr. G. Dobmann, Fraunhofer-Institute for Non-Destructive Testing and A. Jahn, (quality management) of the Company "Kölner Drahtwerke" for their support. Liu, J.; Becker, W.-J. ; Gerhold, T.; Ricken, W., Fehling, E.: Messung der Vorspannungsänderung an Spannstahl mittels Wirbelstromsensoren, DGZfP-Workshop zur Materialcharakterisierung, 10. Mai 2000, Düsseldorf, Arbeitsmappe. Dobmann, G.: Messung der Vorspannung mit mikromagnetischen Methoden, Internationales Symposium "Zerstörungsfreie Prüfung im Bauwesen", DGZfP, 27.Febr.-1.März 1991, Berlin. Jiles, D.; Introduction to magnetism an magnetic materials. Chapman and Hall, London, 1991. Boll, R.; Overshott, K.J. : Magnetic Sensors, in Sensors, A comprehensive Survey, Vol. 5, Ed. : Göpel, Hesse, Zemel, VCH Verlag, 1991. Robertson, I.M. : (1991), "A Review of Investigation of the Magnetisation of Steel due to the Application of Stress", Materials Forum, Vol.15, page117-131. Ricken, W.; Becker, W.-J. ; Schönekess, H. C.: Mechanical Stress Measurement with Magnetic Sensors, Sensors 2003, in Proceedings Vol. I, 59-63, Nürnberg, 2003. Schönekeß, H.; Ricken, W.; Becker, W.-J. : Influences of Magnetostriction and Magnetisation State on Strain and Force Measurement with Eddy-Current Sensors applied to Steel reinforced Concrete, International Symposium NDT-CE, in Proceedings, DGZfP, 16.-19. Sep. 2003, Berlin.